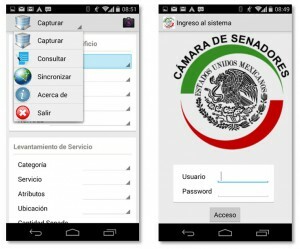 Mexico City, Mexico – November 20, 2014 – The Mexican Senate has just deployed a Mobile Service Management (MSM) application for its Inventory Service as planned, that was developed with Genero Mobile. The purpose of MSM is to empower fifty Senate building service agents that collect maintenance requests with real-time recording, scheduling and validation via smartphones. This dramatically shortens lead times by streamlining the creation of the daily work roster. Future versions will enable Senators to make requests via tablets. Before MSM, the service inventory was created in ‘batch mode’; the department would collect repair information manually during its daily rounds and would note them down on a piece of paper or by digital camera. A work order would be registered in the information system by the supervisor later on. The supervisor would then print the list of work orders and assign the appropriate worker to fix a given request. Service incidents range from basic infrastructure issues including plumbing, heating, electrical, cable, masonry, through to requests to repair or replace furniture, etc. Quality was an issue since there was no record of how well the repair was executed. With MSM, work orders are now created in real-time by the agent using the smartphone’s camera and then sync’d to the main information system where they are dispatched automatically via SMS – eliminating all latency. Once the repair is done, the agent sends a photo of the completed job for quality assurance purposes. Jobs are automatically timed. The application took a little over 2 months to complete for one developer, including the specification, design, development and testing phases. The specification called for Android 4 and iOS 7 support for agents that first need to authenticate through the Senate’s security system (written in Genero). The number of users will grow to 200 agents working on other geographically dispersed sites. These service requests are closely accounted for by the Senate as part of its ‘acceptance process’ with the contract architects.